Currently forty tenure-track UW-Madison professors with a primary teaching or research interest in Russian, Eastern and Central European, and Central Asian Studies are affiliated with CREECA. Faculty members and associates represent a wide range of disciplines, including Art History, Communication Arts (Film), Comparative Literature & Folklore Studies, Forestry & Wildlife Ecology, Gender & Women’s Studies, Geography, History, Jewish Studies, Languages & Cultures of Asia, Law, Political Science, Slavic Languages & Literature, Scandinavian Studies, Sociology, and Theatre & Drama. Our faculty affiliates are nationally- and internationally-renowned experts in their fields. They are regularly published in both scholarly journals and mainstream newspapers, including The New York Times and The Washington Post. Click here for faculty profiles and research interests. 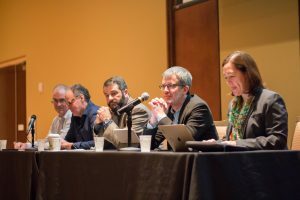 With support from its National Resource Center grant, CREECA offers current UW-Madison faculty and academic staff modest awards to travel to academic conferences in order to present research on Russia, Central and Eastern Europe, and Eurasia. As part of the new Wisconsin Russia Project, funded by the Carnegie Corporation of New York, CREECA will offer grants for faculty to conduct social science research in Russia. The Institute for Regional and International Studies (IRIS) also offers incubator grants to facilitate interdisciplinary research in international or regional studies by UW-Madison faculty members across the sciences, social sciences, and humanities. Additional internal and external awards are posted regularly on our Jobs & Opportunities page.